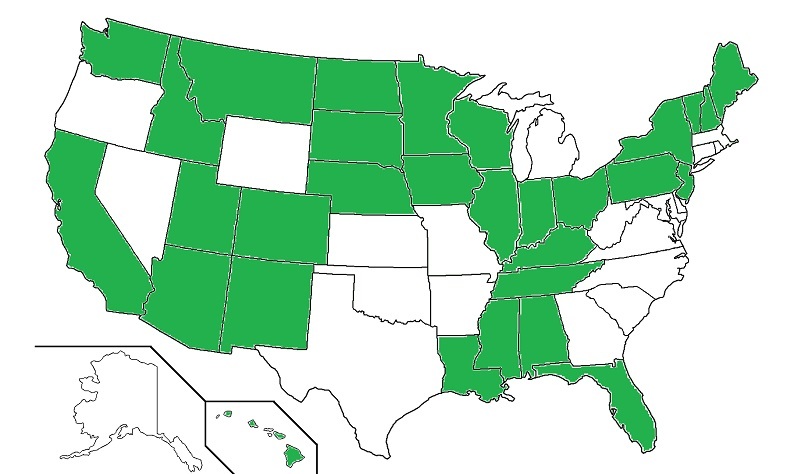 The map below shows the U. S. states where I’ve done any reasonable measure of cycling, such as a tour or event ride. Keeping this list is kind of fun and helps in deciding where to ride next. Many thousands of miles in Arizona. Otherwise, I’ve done the most riding in Iowa on multiple RAGBRAIs, followed by 2 touring legs through both Dakotas. The least covered states include about 45 miles on a rental bike on Oahu, and only 33 miles across the northwest corner of Alabama. Jack says both count. The latest tour added no new US states, but included truly magnificent miles in British Columbia and Alberta Canada. So the current state tally remains at 30. This is as of April 9, 2018. That Thailand listing below? That was two days of combination road and mountain biking from Phuket to and around Khao Sok National Park and the Chiao Lan Reservoir. Sure would be cool to do some cycling in Alaska. Also, hard to believe Jack and I have so far missed both Wyoming and Michigan. And then, there is the rest of the globe. We’ve already covered 3 provinces in Canada.